It’s tough to know where to start. There’s just that much to talk about. he probably wanted to write his thoughts on paper to reach a new understanding of his craft. 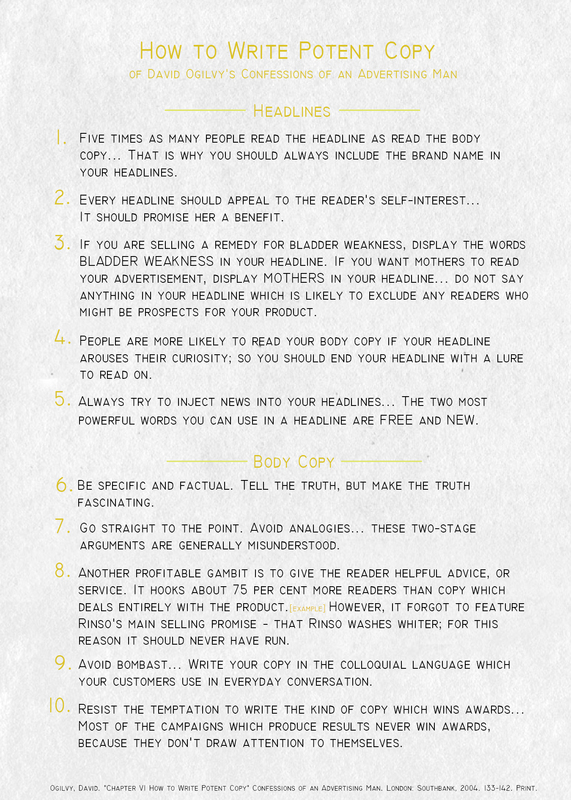 If you’re in marketing, I don’t need to tell you what you’ll appreciate in these tips. And even if you have nothing to do with advertising, you’ll now know a few of the tricks advertisers use to get you to the cash register, and what a bad ad might look like! 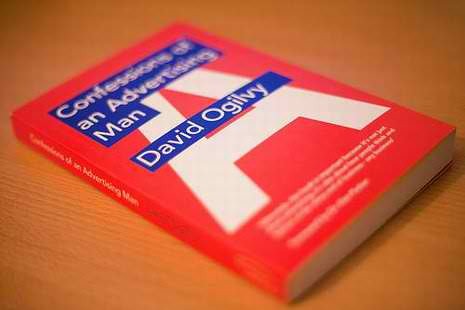 Before you get reading though, remember, OGILVY WROTE THIS BOOK IN 1963. Times have certainly changed, which is why you won’t find anything from his chapter on creating TV commercials. The economy is different, people’s buying behaviors are different, and their attitude toward a brand’s role and that brand’s advertising in their life is different. So, take these tips for what they’re worth. Most still ring startlingly true today. #7 describes why ReadingGlassesShopper.com is One Click Ventures’ best property – they have a low unit cost, people everywhere NEED reading glasses, and they are in frequent purchase because owners lose them all the time. Number three is quite interesting. Ogilvy may mean figuratively sitting on the same side of the table, but it really does help soften things if you do physically sit next to the person rather than across from them. I always thing it’s interesting all tables for two are set up with the seats set across from one another rather than beside one another. If you’ve had a bad date, blame that. Number one can be discouraging if you’re in the art world, but it is important to remember the message and purpose matter first. 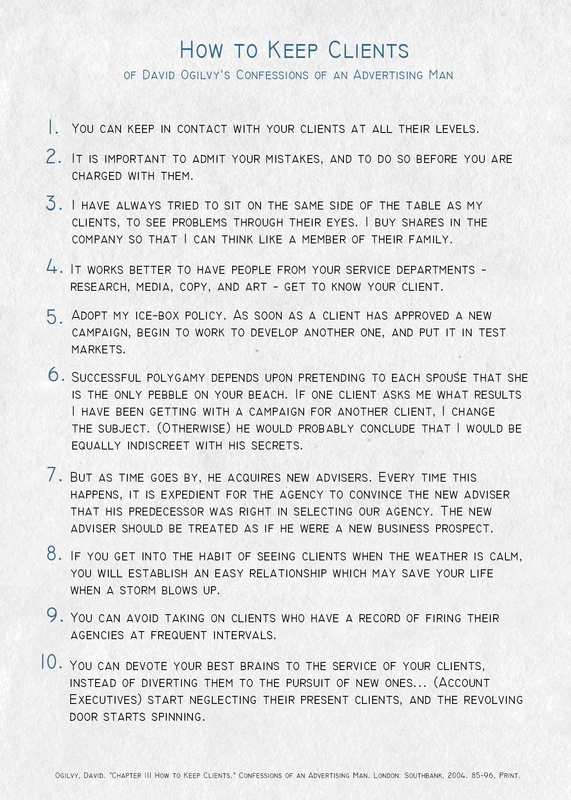 I really wish more advertisers had families with kids to act as a conscience, as in #9, and I think #7 can be a good guide to getting things done efficiently. This little guy is a good reminder for anybody wanting to earn readership. Headlines arouse curiousity, and should promise a benefit. 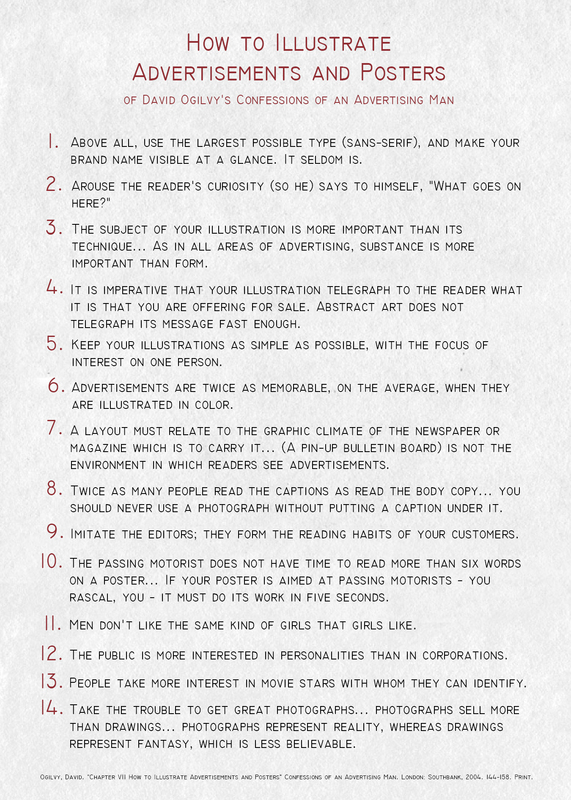 Hopefully you wanted to know what Ogilvy’s 5 How To’s were or to print these graphics. Otherwise, I’ve misread my audience. Rand Fishkin at SEOMoz closed his speech with making the internet a better place. For me, that gave advertising a purpose. Whether you educate, entertain, or inform about a product, it’s imperative your content provide value to the reader. Again, we hear substance is more important than form, but one may argue that form may get people to actually stop to read the substance. My favorite is #10 – count just how many billboards on the interstate you absorb that have more than six words. Did you catch the message? Did you know who or what it advertised? What billboards do you even remember, right now? Of course, street corners with stop lights are different, as are subway line graphics. It’s important to remember the needs of the immediate audience from an environmental standpoint and not just a psychological one. And there you have it. 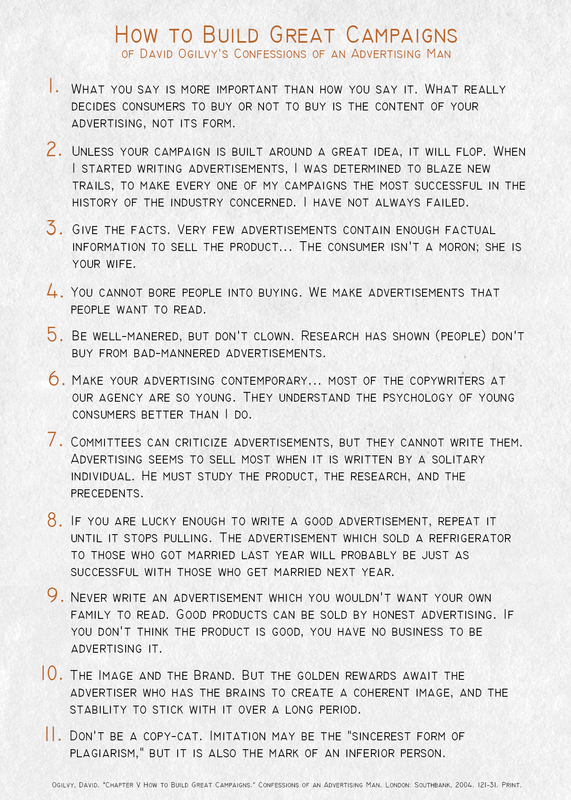 You can now advertise like a genius in the 1960s, and with a little digital education, today as well. 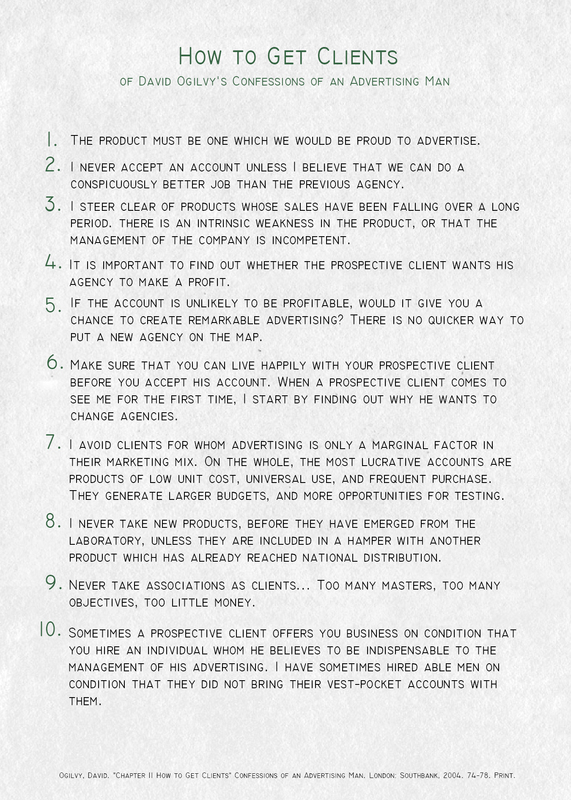 I hope this helps you become more aware of your communication and business approach, and that you read Ogilvy’s book. As another internet marketer and SEO friend of One Click Ian Lurie (Portent, Inc.) said in this post back in 2006, it’s a great tool to “return to it often for a renewal of purpose.” The book covers the basics, reminds you to tell the truth, and tells you to provide value to other people. Those things alone are worth the read.